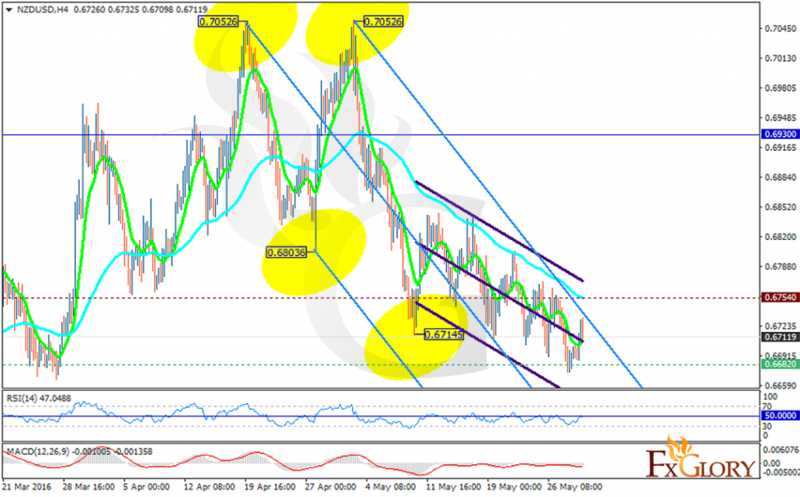 As the American market was closed on Memorial Day, NZDUSD is chiefly under the influence of New Zealand economic reports such as: Building Permits MoM, NBNZ Business Confidence, NBNZ Activity Outlook and M3 Money Supply. On Monday NZDUSD had a sharp fall but later it moved back up and today it continued its bullish trend however there was a pullback right after that. The support lies at 0.66820 with resistance at 0.67540 which both lines are below the monthly pivot point at 0.6930. The MACD indicator is in negative territory and the RSI is in the neutral zone. The EMA of 10 is located below the EMA of 75 confirming the bearish scenario of the recent days. Short positions are recommended at this moment.